Yea! I am the first...that should count for something! Funny, those are all my favorite things too....especially the PB M&Ms.....umm!! I LOVE your blog! Keep it up!! Dang it! If I wasn't just talking on the phone with Jen, I would have been first! I love PB M&M's and red vines too! And of course Target and Sonic. I'm so glad you started your blog! I love reading what you're up to and seeing your cute kids grow up. Hi mom! your the best mom in the world.Sign me in the drawing I love your blog. I never ever reapeat never ever posted on your blog your. Congratulations on hitting 100! 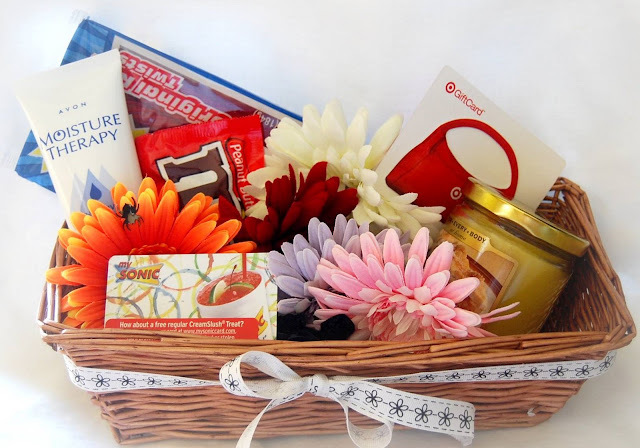 You are SO cute for doing this basket thing, very creative. I'm amazed at all the giveaways people do, although I've never participated in one. Fun idea! I love chocolate licorice and carmel apples. I like the ideas on www.notimeforflashcards.com. I'll keep my fingers crossed! So far I have been a silent blog-stalker, but thought this would be a good time to leave my 1st comment & congratulate you on your 100th post. I had no idea you have done that many posts! I also had no idea you're the one making the super cute flowers in your girls' hair. Two things I love: Just about anything with peanut butter (especially reese's pb cups) and ice cream. I enjoy reading Cari's blog, where I am also a silent blog-stalker, and that's how I came upon your blog! Yea! Okay, so from the last post I commented on you probably figured out I love your pictures and think your blog is so fun. Your address is similar...maybe you'll it too. One of my favorite things right now...fresh veggies from the garden. Pick me! Pick me! You are so fun Jane! My two favorite things are Diet Coke and the Milky Way dessert at Zupas. This blog won't be new to you, but I just love reading Marcie Coombs blog. It's always entertaining! Jane, I just read your sweet comment about my wall. Sorry I didn't invite you in to see it. You need to come over tomorrow and tell me what you think! Thanks for everything you do for me and my family. I just think you're lovely in every way! Just so you know...my two favorite things are 1. family time and 2. chocolate. My favorite blogs to read are EVERYONE. Seriously...I'm so addicted. My sister Sam is pretty creative like you and so it's always fun to check out her cute pics. She also has the same camera as you (lucky). I, of course, love chocolate. Maybe that is why I should walk the hills at least twice a day. My other favorite new found love is Lime Slushes from Sonic. One of my favorite blogs is http://hair4myprincess.blogspot.com/ This is a friend of mine from down south. From her hair blog I can hook up to other hair blogs and get tons of cute ideas for hair. (I honestly love seeing everyone's blogs because it is so fun and a lot of times the posts give me a good healthy laugh). You are so creative! I love reading your blog just to get ideas! My other favorite blog (besides yours) is thesweettoothfairy.blogspot.com. My two favorite things are: Victoria's Secret lip gloss and Crystal Light. Jane you know I love reading your blog and looking at your pics. Two of my favorite things are sweet kisses from my kids and my new camera. I am addicted to reading NieNie and Cjanerun linked from my blog. Congrats on 100. I think i might copy you if I ever get to 100! They have some yummy stuff on there. Diet Coke for sure...and, let's see...I really like this gradual sunnless tanner by Too Faced. It's called Tanning Bed in a Tube, and it leaves your skin looking bronze and beautiful almost instantly. As far as my favorite blog to read? I have a lot that I really enjoy, but I always love when either of my sisters-in-law (Amy and Brooke) post something new. Congrats on hitting 100! Love your adorable photos, great sense of humor, and sense of style. I love it when people give me presents, and getting pedicures. And well, if the present is a pedicure, what's better than that? Going on a Sonic Happy Hour run with my kids after school. Watching my kids sleep after the caffeine has worn off. And one of my favorite blogs to read (other than yours...) would be none of your beeswax. That is the name of the blog! I am not just being rude!! How fun! I just read all the comments and now I can't pick two of my favorite things, everyone has such yummy things to say! But, I will try! Blogs, I really like to visit my friends from work to see what they are still up to and also my friend Brody's. His wife Jen is like you, cute, crafty and great with a camera! #1 My baby and every little (or big) smile, laugh, squeal, cry, barf, hug and kiss that comes with her. #2 SHARKS I love them. Happy 100, Jane! This is my kind of giveaway!! I really am glad I found you. Your blog is always fun for me to see. A Favorite Blog?! I would say Ali Edwards. Right now she is doing a week in her life and I love all the images, so simple yet real. I love the tv show Intervention and Halloween. Okay, I'm obsessed actually with Halloween. I spent an hour at Target last night, just in the Halloween section. Sad. One of my favorite blogs (besides all my gossip sites) is thepioneerwoman.com. She gives me all sorts of great recipes and has fabulous tips on how to shoot with those fancy camera's and use the improved photoshop. You should go check her out since you are so good with the camera! I want to know what James is going to do with the hair clips if he wins the drawing. He is so cute. I know you said a favorite blog besides yours, but I get such a kick out of all of your posts! Jane you are so funny. How did you even come to realize it was your 100th? What a cute idea. I love soccer practice with my three soccer champs and I love dinner with the best girls night out buddies in the world. My life would be boring without all of you. Other than your blog I love to see the soccer blogs the moms have done. Wow, 100! Chocolate and Fall days are my favorite things. I love reading laululog.blogspot.com. *Making cards. I don't care too much for scrapbooking, but I LOVE cards! *My scanner. Now I can scan all my old pictures. This is TO DIE FOR!! I MUST have those flower clips!! I'm also a HUGE fan of nepotism. My favorite blog will be Mom's, once she starts one. May the best younger sister win!! Congratulations on the 100th post! Two of my favorite things (first things that came to my mind right now)... #1 Rose of Sharon, We're doing our backyard at the moment so I look at plants a lot right now :) So Pretty! #2 Quaker Simple Harvest Instant Oatmeal! So yummy, and Alexa really likes it too! One of my favorite blogs to read (besides yours)is the wolfgrammword. Brooke is really creative with her posts, and has really funny stories. ...Please can I win...I would really put those flower bows to good use! How can you not randomly choose James after that cute comment?? Well I'm going to...So President James as one of my favorite blogs. Two of my favorite things noodles and long books about werewolves. I assume you realize that this contest may cause a divide. also, I'm doing this instead of cleaning...again. Favorite blogs: any with recipes! Hi Jane!! I was so excited to get your comment on my blog. You haven't changed. You are still one of the most loving, fun and creative people I have ever known. You still love Red Vines and Avon. You used to always have the greatest jewelry from Avon. Your family is absolutely GEORGEOUS!! We come to Utah periodically and I would love to see you next time we are there. Diet Coke is one of my favorites as well. We don't have Sonic here in Seattle, and I miss it SOOOO much! I use to go to happy hour everyday and get a Diet Coke with lime. I have to settle for AM/PM here, but they do have the really good ice. I also love anything with chocolate and peanut butter. I just bought peanut butter cups from Trader Joe's that are awesome!I love all blogs that catch me up with friends that I have not talked to in years! :) It is such a great way to get back in touch with people. 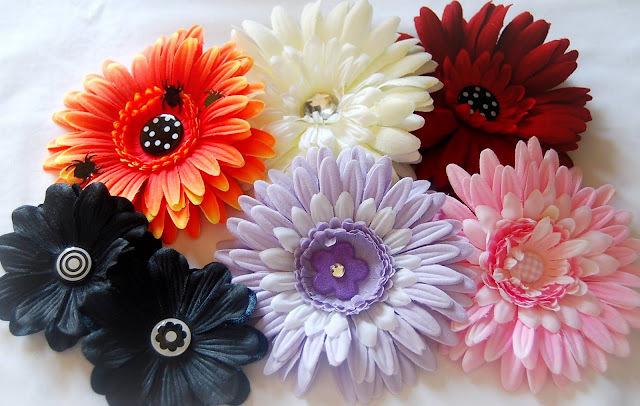 I LOVE your flower hair clips. Do you sell them? I would love to buy them from you. Please stay in touch! come on lucky #34. Well, your favorites pretty much sum up my favorites. I guess I could add massages and Thai food. Oh, and definitely not pregnant :) you're in trouble for your comment on my blog. Comments like that get mother theresa waaaayyyy too excited. My favorite things: date night and watching my kids play in their sports! Favorite blogs: I love looking at the Foutz kids' blogs. Get Susan on board and I'll be in blog heaven! Hi Jane! Joe's wife Marci here. I always enjoy taking a peek at your blog. What a fun idea for a giveaway. Too bad we don't live closer - I'm sure we'd be great friends just by the things you put in your basket. They're all my favorites too! On top of those I LOVE....pumpkin bagels with cream cheese from Einstein Bros. AND Paradise Bakery oatmeal choc. chippers. 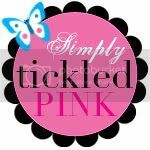 I love reading the 'pickypalate' blog - great recipes there. 1) Tickling my naked baby girl and kissing her belly just to see her laugh and grab my face, while I'm getting her dressed in her adorable little baby clothes, complete with an exquisite bow or flower in her hair. 2)You well know me and my intense craving for a Route 44 Diet Coke with Coconut Cream, Easy Ice. I know you're not exactly into it, but my favorite site to look at besides my good friends is Stephenie Meyers. And "cutestblogontheblock" for blog embellishments. and many of my friends: Sandy, Lisa, Kimmy, Aimee, Amber, & Mandy. Jane, I found your blog from Katie's blog. I used to work with her at the Utah Capitol before moving to D.C. I'm Jen and I don't know if you remember me. I love your photographs and you are talented. Ooooo Oooooo! Sign me up! I would love to win!! Two of my favorite things are a good book and a sweet treat (at the same time of course). Some of my favorite blogs are www.indieart-blog.blogspot.com and happyfullmers.blogspot.com. Both amazing photographers that took pictures of my boys in there beginning days. I love your blog! This is Courtney's sister Becky. I always have a hard time thinking of my favorite things on the spot, but I will have to say that I love my new Shark steam mop. I also love Orange Blossom Honey, it is the best kind out there. One of my favorite blogs to visit lately is: mykitchencafe.blogspot.com, It has come in very handy as our family is trying not to eat out as much. She has some really great recipes! Check it out. Jane that is so nice of you to give all that away! Two of my favorite things are Cafe Rio & Target! Also, a great blog I read is moneysavingmom.com! It is SO awesome, but you probably already know about it since you are quite the money saving mom. Holy cow, Jane. That's A LOT of readers! What a fun idea! She's a friend that just cracks me up. I am a complete stranger but I look in on your blog from time to time. You are very talented and always have great posts. Anyway, there are many things that are my favorite but my top loves would be my husband and children, of course. And when I have a little time away from them, I love to get a pedicure or have my hair done. I love having freshly painted toenails and new highlights in my hair. I love fall, food and friends too. I could go on and on about so many things that I love but I'll stop there, especially since I have listed more than two of my favorite things. Well, I am excited to be part of the drawing and good luck to all those who commented! Jane...why do you make all us other bloggers look so bad? jk! So I always tell Torrey about the comments you put on our blog and he just laughed and said..."so do you and Jane talk other then the blog?" I replied "yes we say hi at church" ha, it is so true how blogs bring people together. So while I aspire to be more like you in your blog...shopping...picture taking...just to say a few here are my favorite things. Holding my baby girl and spending time with her that I will never get back. Seeing everyone's amazing pics they do of their children. I want a new camera SO badly!!!!! Favorite blogs to read...wow that is a hard one because there are tons out there...especially in our ward. I love your's and Rudy's...I envy the great shots you two always have! Two favorite things...avon lotion you got me addicted to, and the smell of fresh cut grass. I love your blog to see your sweet faces and also for the many tips you give out about grocery deals. I also love Kath's blog for recipe ideas. Everytime I read hers I salivate. WOW, I get to re-connect with an awesome friend and enter a contest - WOO HOO! I was so excited to hear from you - When I saw "Jane", I was like, NO WAY!!! You kids are BEAUTIFUL!!!! I have not found a pic of you yet, I have a lot to read to catch up! THANKS for saying HI - I am so happy to see you are doing so well. KEEP IN TOUCH! Where do you live? Still in AZ? Jane, lets trade flower clips or bows! =) Okay, my favorite things: getting my hair done and eating out! And a blog you must check out is piggiesnponies.blogspot.com for the cutest hair do's for girls. You will LOVE it! I so enjoy reading your blog. I found you through Joey Brough. It's good to see people who are active with children and family, and yet have something to say besides those things. One of my favorite blogs, which I cannot find anymore, was a Marlo Walberger who had her only child drown in July. I was reading it before her loss, and have found a few others from hers that have been inspiring to me. Jane - your blog is one of my favorites to read. You take the cutest pictures and always have sweet stories to tell. Some of my favorite things include cozy socks and chips and salsa although I love all of your favorite things too....Target is divine. Hi Jane! I saw the link to your blog on Mary's and couldn't resist peeking... I am always drawn to other twin moms...especially twin GIRLS. It's fun to have that in common. :) My twins are Julia's age! Anyhow I love your blog and your family is adorable. Alright, so I'm not first or second or third as far as that goes...but I love reading your blogs especially the one's about what your kids say. I love the cute things kids say. I love doing crafts, just don't ask me to come up with the idea. I too, love peanut butter m&m's (they are my one big downfall when it comes to being on a diet) oh, and twizzlers. OOOOOOOOOhhhhhhhh....I ALMOST missed my chance...i'd rather be last, then my name is FRESH on your mind! Two of my favorite things...BABY LEGS...Emery is wearing her first pair today and i am just ITCHING to get the camera out for a full blown session, they are SOOOOO cute! #2 The smell of my husband with cologne....mmmmmmm.....seriously just makes me melt and melt...I love to nuzzle into his neck when he puts it on! Great blog to follow...oh there are SOOOO many but for a good photo one http://capturedbycarrie.com/blog/ you have never seen more beautiful unique baby photos, it seriously makes me SOOOO sick with jealousy, the girl is AMAZING! Congrats on 100, I love your blog! I wish I would've noticed a 100th post, I probably past it already, i'll have to look. Hi Jane, I know my post is late but I just wanted to say hi and say that my favorite blogs to visit are Katie's because she always makes me laugh and vivafullhouse.blogspot.com this is Dan's cousin that had twins and triplets and she always has new stories between her 5 kids within a couple years! My favorite things are coldstone ice cream and Banana Republic.